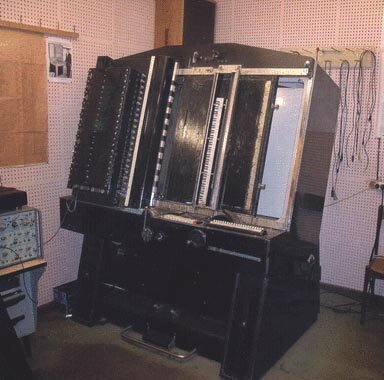 The ANS – a forgotten pioneering Russian synthesizer. Theremin was not the only Russian to pioneer electronic music equipment. There was Evgeny Murzin’s ANS, a giant synthesizer that used photocells to read scratches from rotating glass disks to make music. Somewhat like the Optigan organ, but far more complex. And dating from 1937. Read about it here, here and here. Yes, Matrix ran it. Coil used ANS sounds on an album in 2004.
thanks for posting this info on the ans. i had never read the stanislav kreichi piece before. good stuff. i hope i’ll get the chance to play the ans someday. i visited your link to the threshold house site and was reminded that the coil ans box set came with a dvd, but i couldn’t remember what was on it. i’ve had it for years but somehow never watched it. i just experienced it for the first time. it’s incredible!